Mahmoud Ahmadinejad, President of the Islamic Republic of Iran, (the only country in the world with no homosexuals) has been feeling under the weather lately and has fallen ill. According to Associated Press, Iranian President Mahmoud Ahmadinejad has fallen ill due to exhaustion brought on by his heavy workload, a close associate has told the Iranian state news agency. Ahmadinejad is normally tireless in his performance of duties, which include pushing for Iran's nuclear program and showing his enthusiasm for an Obama presidency. It has been a rough week for Mahmoud. His good friend SheikHassan Nasrallah is also been feeling under the weather and was allegedly being treated by Iranian doctors to counteract a poisoning attempt. "Deep down, he's a nice guy". commented Melech Movess, an Israeli journalist who is an expert in Iranian affairs. Homer Chump, an adviser to the Obama campaign on defense affairs expressed concern for Ahmadinejad's health. "This friendly president of a tiny country is a man we had looked forward to working with during an Obama presidency. We certainly wish him well." Seymour Swishburne, Obama transition team member in charge of decorating the White House for the Obamas dismissed reports that Ahmadinejad had referred to America as "The Great Satan." "Oh that's just plain silly." tittered Mr. Swishburne. 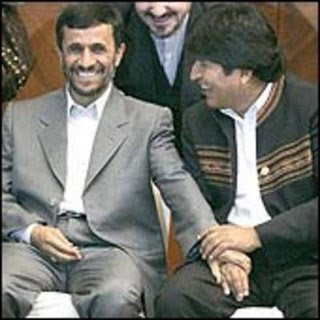 Everybody knows that Ahmedinejad doesn't really speak English. He really means satin. Mrs. Obama loves satin. She and Mahmoud are really going to hit it off. I do hope Mahmoud comes by to say hello.."
Mullah Abdullah, office manager of the Gaza City headquarters of the Obama for President Campaign also expressed concern for Ahmadinejad's health. "A lot of my workers are really grateful for President Ahmadinejad. said Abdullah. He pays pensions to the families of suicide bombers and other freedom fighters. We want to help the Great Satan commit suicide too. Our phone bank is just our small contribution to the cause." The fifty two year old flamboyant president is unlikely to let his illness slow him down. "After leaving office, I have an offer to sell hairpieces for men" , Ahmadinejad said through a translator in an interview with Palestine International Militant Press (P.I.M.P). "My friends in the Revolutionary Guards just expropriated a toupee salon from some Zionist imperialist lackey. We have enough inventory to last about a year and a half. After that, they'll find another Zionist imperialist Bahai freemason, and that will keep us going with confiscated inventory for a couple of more years."